Disconnect the harness connector From the accelerator pedal assembly. Loosen bolts and remove accelerator pedal assembly. Do not disassemble accelerator pedal assembly. Do not remove accelerator pedal position sensor from accelerator pedal assembly. Do not drop or impact the accelerator pedal assembly. Do not expose the accelerator pedal assembly to water. Insert the locating hook and pin into the brake pedal bracket. Do not squeeze the locating hook into the brake pedal bracket when inserting the locating pin into the hole on the brake pedal bracket side. Check that the accelerator pedal moves smoothly within the specified range. 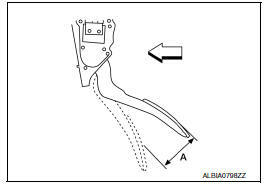 Accelerator pedal stroke (A) : Refer to ACC-5, "Accelerator Control"
For the electrical inspection of accelerator pedal position sensor. Refer to EC-138, "Work Procedure". 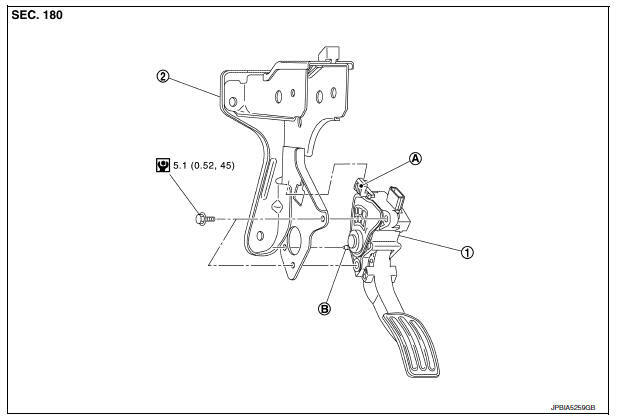 Whenever the harness connector of accelerator pedal position sensor is disconnected, perform вЂњACCELERATOR PEDAL RELEASED POSITION LEARNINGвЂќ. Refer to EC-138, "Work Procedure". The accelerator pedal should return smoothly to the fully raised position.